If you’ve been told that you have advanced lung cancer, you’re probably feeling overwhelmed if not totally terrified. What does this mean? How is it treated? And how can you get the support you need? What does it mean when doctors say “advanced lung cancer?” Most of the time when doctors use this term they mean stage IIIB and stage IV lung cancer. Though small cell lung cancer can be advanced, most of the time when oncologists use the words "lung cancer", they are referring to non-small cell lung cancer, which is responsible for 85 percent of lung cancers. The reason that lung cancer is frequently divided into early stage and advanced stage is that they are treated differently. For early stage lung cancer, surgery is often recommended as a first-line treatment, whereas other options are preferable for advanced stage disease—at least initially. As noted above, the phrase "advanced stage" is usually used to describe stage IIIB or stage IV non-small cell lung cancer. Stage IIIB - Stage IIIB non-small cell lung cancers are tumors of any size which have spread to lymph nodes on the other side of the chest, near the collarbone, or have invaded other structures in the chest such as the heart or esophagus. Stage IV - Stage IV non-small cell lung cancers are tumors that have spread to the space between the layers lining the lungs (malignant pleural effusion) or to another region of the body. Lung cancer most commonly spreads to the bones, the liver, the brain, or the adrenal glands. The symptoms of advanced lung cancer may be related to the presence of the cancer in the lungs, or due to the invasion of other organs and spread (metastasis) to other regions of the body. Common lung-related symptoms may include a chronic cough, shortness of breath, coughing up blood, and wheezing. Lung cancers may press on nerves in the chest causing hoarseness. When lung cancer grows larger or spreads, symptoms such as fatigue, unintended weight loss, and loss of appetite may occur. Lung cancer which has spread to the brain may cause headaches, speech difficulties, memory loss, and weakness. Lung cancer which spreads to the liver may cause abdominal pain and jaundice. And lung cancer which spreads to the bones may cause pain in the back, shoulders, and chest. Advanced lung cancer may be initially found on an x-ray or CT scan, but further testing with a lung biopsy is necessary to determine whether or not an abnormality really is cancer, and what type it is. For advanced non-small cell lung cancers, it is especially important that gene profiling (molecular profiling) is performed. While traditionally, tissue from a biopsy is needed to do this profiling, in 2016 a liquid biopsy test was approved for EGFR mutation testing. Lung adenocarcinoma - Which is responsible for roughly half of these tumors. This is the type of cancer that is most common in women, non-smokers, and young adults with lung cancer. Squamous cell carcinoma of the lungs - Which is responsible for around 30 percent of non-small cell lung cancer. Large cell carcinoma - Large cell lung cancer makes up around 10 percent of non-small cell lung cancers. Other - You may have noticed that the numbers above don't add up to 100. This is because some tumors have characteristics which are found somewhere in the gray area between the above categories, such as an "adenosquamous" appearance, or different regions of the tumor may have the appearance of two or more different types of tumor. It's important at the beginning to state that treatments for advanced lung cancer are improving. Survival rates for advanced lung cancer are improving. Therefore, any statistics you read, or any treatment information you read that isn’t up to date, could be very discouraging. It’s important to learn what you can about your disease, but take a moment to learn how to research your cancer online. As an example, there were more new treatments approved for advanced lung cancer in the period between 2011 and 2015 than during the 4 decades prior to 2011. There is a lot of hope. Patients are becoming more involved in their care with lung cancer than ever before. Unlike the paternalistic patient-doctor relationships of the past, patients and doctors are working together to design the best treatment plan possible. Part of the reason for this is that there are more choices than ever before, and some decisions may relate more to your personal preferences—the side effects you are most willing to tolerate—than any medical superiority of one treatment over another. It's helpful to begin by breaking down treatments into 2 basic types. Local therapy – Local treatments treat a cancer where it is—locally—and include radiation therapy and surgery. Systemic therapy – Systemic therapy is aimed at treating cancer anywhere in your body. These include chemotherapy, targeted therapies, and immunotherapy. Targeted Therapies – Everyone with advanced non-small cell lung cancer should have molecular profiling (“genetic testing") done on their tumor. This is usually done on a biopsy sample. There are now several chromosomal abnormalities and gene mutations in cancer cells which are "targetable", and more are being found all the time. A targetable abnormality refers to an abnormality on cancer cells or related to cancer cells which can be specifically targeted by medications. If you have an EGFR mutation, ALK fusion gene, or ROS1 rearrangement, there are approved targeted therapies available—and this area is likely to expand rapidly in the next years. If "molecular profiling" does not sound familiar, make sure to talk to your oncologist. Immunotherapy - If you've been watching the news or reading any magazines you've probably heard a bit about immunotherapy. Unlike some of the hype in the past, immunotherapy is truly a very exciting approach for treating advanced cancers. These treatments can be thought of as essentially harnessing our own immune systems to kill cancer cells in different ways. The first medication for lung cancer in this category was approved in 2015, and several more are being evaluated in clinical trials. Clinical trials – The National Cancer Institute recommends that everyone with advanced lung cancer consider clinical trials. There are a lot of myths about clinical trials, but more than ever before clinical trials may offer people with lung cancer the opportunity to receive newer treatments for the disease. For example, the people who participated in the clinical trial for the immunotherapy drug approved in 2015 did much better than those who did not have the opportunity. Keep in mind that every approved treatment for lung cancer was once studied as a part of a clinical trial. There are currently well over 100 clinical trials in progress evaluating new treatments for lung cancer. Check out this information on how to find clinical trials for lung cancer, as well as the free clinical trial matching service provided by a joint effort between several lung cancer organizations. In the past, treatment of lung cancer with metastases was essentially the same for everyone. That's changing somewhat. For some people with brain metastases from lung cancer or liver metastases from lung cancer — if there are only a few "lesions" or spots of spread—something referred to as "oligometastases”—treatment with stereotactic body radiotherapy or surgery has resulted in improved survival. 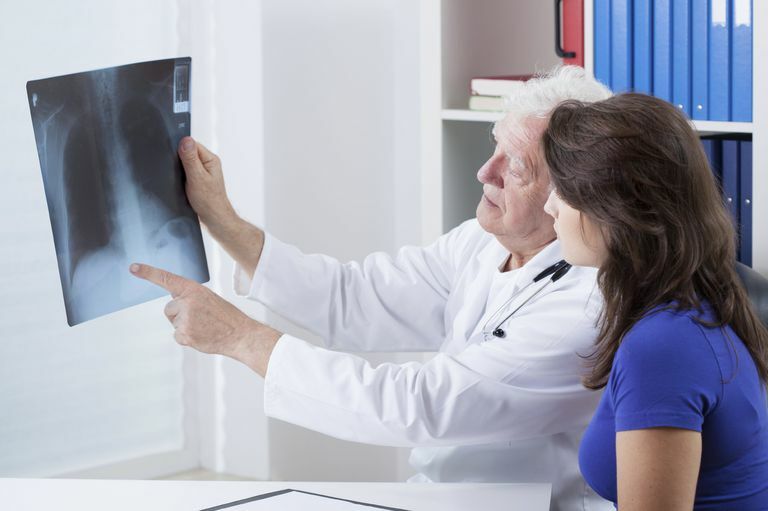 For people with bone metastases from lung cancer, drugs known as bisphosphonates as well as radiation therapy may help with pain control, and may, in some cases, improve survival. It's hard to talk about the prognosis of advanced lung cancer because we will be talking about statistics that were gathered before several of the preferred treatments for advanced lung cancer became available. The last statistics gathered found that the 5-year survival for advanced lung cancer was sadly less than 5 percent. That said, there are long-term survivors of advanced lung cancer, and that number is growing. What you’ll quickly learn after being diagnosed with advanced lung cancer is that lung cancer takes a community and that it’s a family disease. Reach out to family and friends. Learn to be your own advocate in your cancer care. Consider reaching out to the online lung cancer community—a community that has become like family to many people with advanced lung cancer. Caring for a loved one with lung cancer will be perhaps the most difficult thing you ever do, but the most rewarding and life enriching as well. Make sure to take a moment and read this article on when your loved one has lung cancer.